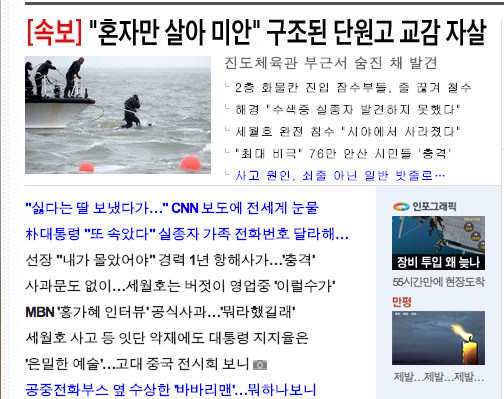 In case you haven't seen it in the news, on Wednesday morning a 6,825-ton ferry (Sewol) sank off the coast of Jindo Island with 475 people on board. Currently 179 people have been rescued, 28 are dead, and 268 remain missing - trapped in the now-sunk ferry. Many of the people aboard the ferry were Danwon High School students on a school excursion to Jeju Island. Danwon High School is in Ansan, which is southwest of Seoul in Gyeonggi-do Province (the province I live in). I know at least one teacher at my school who has a friend that's a parent of one of the missing high school students. I think many people nearby know someone who knows someone who has been directly affected. And regardless, all are saddened but also angry about what's happened. Some teachers at my school yesterday expressed anger towards the captain - that he didn't do everything he could to save and evacuate all of the passengers before he left the ship. My co-teacher kept saying what shame, what shame. Many are also upset at the seemingly slow and small rescue efforts, including the fact that it took two days for the big crane to even get to the ferry (arrived around 1 p.m. today). During English club yesterday afternoon a teacher said that he thinks Korea is very far from becoming a top nation, evidenced by the ferry disaster and how it was handled. I think he's being hard on his country - to judge the whole nation from actions of few - but Korea, like many other Eastern nations, has a collectivist society. He and many others felt ashamed of the captain/crew and government for the cause and handling of this disaster. What surprised me yesterday - and what you won't see on the news - was when my co-teacher told me that many upset and angry parents had stormed the Gyeonggi-do Education office. Because of the ferry tragedy and the parents' complains, it's very likely that all field trips in the province will be cancelled. Yup. Elementary, middle, and high school. Until when? I'm not sure if this is an indefinite move or not. Our fifth and sixth graders are supposed to go on an overnight field trip next week, and now it looks like an 80% chance that it'll be cancelled. The school is just waiting to hear from the head office for a final say. The fifth graders we taught today were pretty bummed out, both by the ferry tragedy but also that their grade's trip was now gone. Korean kids spend more than enough time at school studying as it is, so to strip them of all field trips because of this seems like a leap in the wrong direction. Accidents can happen anywhere at any time, whether you're on a field trip or with your family or by yourself. The latest news regarding the ferry is that the Vice Principal of Danwon High School committed suicide today, hanging himself near the gymnasium on Jindo Island where parents are awaiting updates from rescue efforts. Korea has a high suicide rate, especially with teens and young adults because of the strong societal/family pressures to perform well in school and on entrance exams. The Vice Principal was 52 years old, and according to a teacher (who declined to be named), he was feeling great guilt because he was in charge of the students' safety. The teacher also said that many parents had vented their anger at the Vice Principal in the last two days. I think it's so tragic that this man thought he was responsible for the deaths of these students, adding another death to the tragedy. Yesterday third-year students at Ansan High School returned to school, and all grades will resume classes on Monday 4/28. 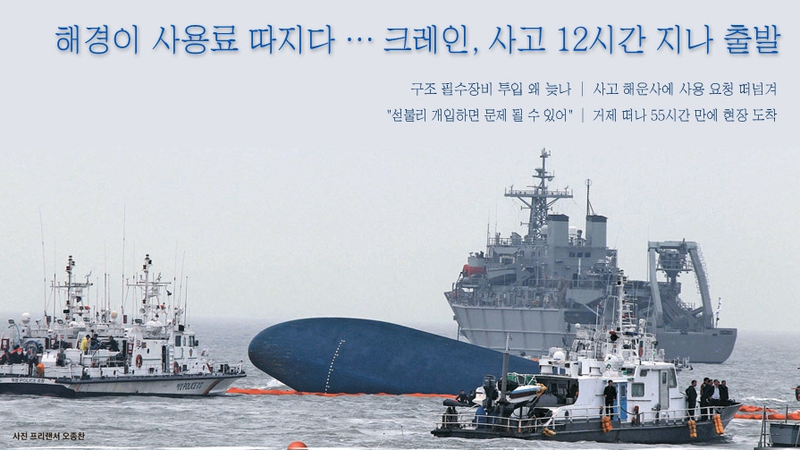 Culture Glaze's Emily Gaynor has put together a summary of Sewol events from Tuesday, April 15 to yesterday. My friend Abby shares some thoughts about the captain and crew, as well as Korea's collectivist culture in the midst of this tragedy.